Wachsenburg Castle is a perfectly restored medieval castle, which today offers visitors many amenities and facilities which are combined with the opportunity to learn a lot about the German history of the local area. Fortress Wachsenburg dominates the surrounding area from its high and covered with thick forest hill. Wachsenburg rises in the picturesque southern German region of Thuringia. Wachsenburg Castle together with two medieval castles is an historical outline of a natural beautiful area known as Wachsenburg. The three castles are known by the name, Three identical. One legend tells on May 31st, 1230 the towers of all three castles started to burn thus having the name, Three identical. In fact, the truth has nothing to do with this medieval history. The castles were named, Three identical, because of its topographical location, based on the heights of the local mountain. Palace Wachsenburg is located near the German city of Erfurt. It has its roots somewhere in the 10th century. In the early 11th century exactly there lived and died a monk. 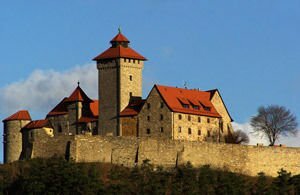 The first historical records about Wachsenburg fortress come from a knight who passed the area in 1140. In the following centuries the palace became the scene of many conflicts and clashes for power and territory. In 1641 Wachsenburg fortress passes into the hands of Duke Ernst who is the main culprit for making the fortification of the medieval castle into a beautiful and attractive palace. Wachsenburg Castle has the shape of a square measuring 50 to 50 meters. The height of its majestic tower is a splendid view of the picturesque region of Thuringia. The high tower was erected in Rome and is the most emblematic of Wachsenburg. It was built originally in the 17th century but subsequently demolished and in 1903 the royal architect Franz Joffe had ready his plans for the restoration. Today the Wachsenburg Castle offers its visitors the opportunity to see an interesting museum, whose exposures are set out in the north wing in the high tower of the palace. The museum consists of several rooms, furnished in authentic style - a memorial room, the room with weapons, agricultural room and room Gustav Freitag. Within the Wachsenburg Castle you can visit with a popular gourmet restaurant kitchen. It has a lovely garden which can hold up to 100 people. Wachsenburg is a favorite place for various celebrations, such as the number of weddings which are hosted there each year.